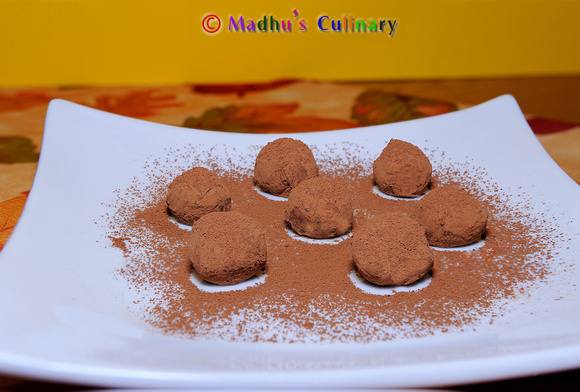 Chocolate Truffle ->Suvayo Suvai | Simple Vegetarian Recipes, Easy to prepare and healthy to eat! A Recipe from the West. I always wanted to learn something from this part of the world which was simple and easy to prepare and yet liked by all. Chocolate is universally loved and eaten by everyone. When I came across the Chocolate Truffle recipe from my Favorite Food host Giada De Laurentiis, i wanted to try it myself. So here i am sharing with you all my outcome. Take a small pan and add water to 1/4 level. Boil it over hot but not simmering water. Take a bowl and fill it with the chopped dark chocolate and heavy cream. Place it on top of the boiling pan (Double boiler). Once the chocolate is melted place it aside and add the Balsamic Vinegar and mix it. Cool the chocolate in the Fridge for 1 hour. Remove the chocolate from the Fridge and keep it in room temparture for about 2 hours until the content is firm and moldable. too melted while making the balls, keep it in fridge for 5-10 min and proceed. Roll the chocolate balls in the cocoa powder and keep it in a tray. Serve it immediately or keep it in a airtight package and refrigerate for later use.